A general warranty deed in South Carolina is customarily used in residential real estate transactions to transfer title to real property. A statutory form for a conveyance of real property in fee simple is presented in section 27-7-10 of the South Carolina Code and can be used for a warranty deed. Every real estate deed in this state will pass the entire interest of the grantor in the property described in the deed, unless a contrary intention is provided in the deed (27-5-130). The statutory form includes a guarantee from the grantor that he or she will warrant and forever defend all and singular said premises unto the grantee and as against the grantor, his heirs, executors, and administrators, and against every person lawfully claiming or to claim the same (27-7-10). The statutory form does not oblige any person to insert the clause of warranty and does not restrain a person from inserting any other clause (27-7-20). 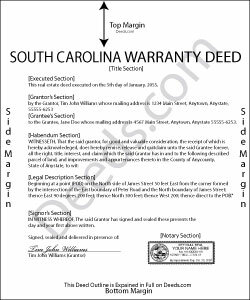 The execution of a warranty deed must be acknowledged or proved in accordance with South Carolina law in order for the document to be recorded with the register of deeds. Warranty deeds in South Carolina require two witnesses. A notary public may function as one of the witnesses. A deed can also be proved by the affidavit of a subscribing witness to the instrument, taken before an officer in the state competent to administer oaths (30-5-30A). Alternatively, a deed can be signed by the grantor and acknowledged. The signing must be acknowledged by the grantor in the presence of two witnesses, taken before an officer in the state competent to administer oaths. Acknowledgments can also be taken out of state before any of the officers listed in 30-5-30B and must comply with the Uniform Recognition of Acknowledgments Act. Warranty deeds in this state are statutorily required to contain a derivation clause (30-5-35). The proper recording of documents establishes a priority of claims against a specific property. A warranty deed is valid so as to affect the rights of subsequent creditors or purchasers for valuable consideration without notice only from the time it is recorded in the register of deeds office in the county where the property is located. In the case of a subsequent purchaser of real estate or in the case of a subsequent lien creditor on real estate for valuable consideration without notice, the instrument evidencing the subsequent conveyance or subsequent lien must be filed for record in order for its holder to claim under this section of the laws as a subsequent creditor or purchaser for value without notice. The priority of instruments is determined by the time of filing for record (30-7-10).